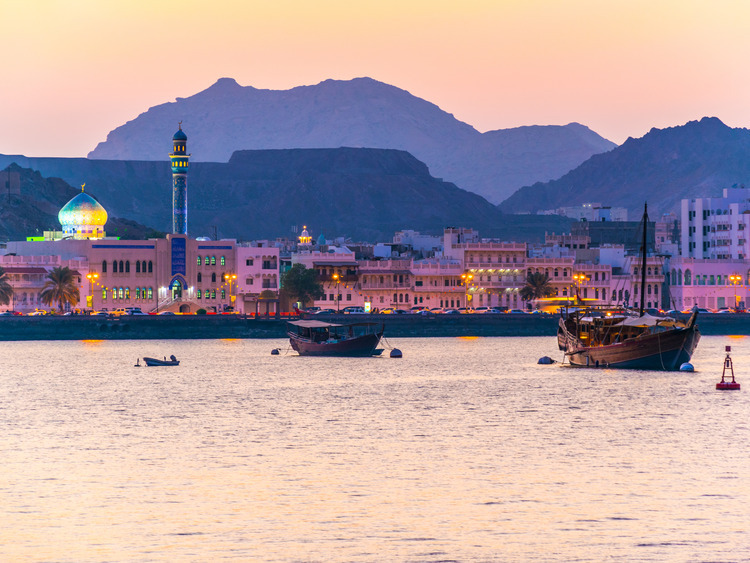 A panoramic excursion to the discovery of the beauties of Muscat and Nakhl. Leaving the port of Mina Qaboos we travel alongside the majestic Al-Alam palace, the official residence of Sultan Qaboos, situated in the heart of historic Muscat and adorned with columns decorated in gold and blue with arches, majolica tiles and carvings. We then head for the Bait Al Zubair museum, built in 1914 as a private residence and inaugurated as a museum in 1998 for the purposes of displaying and rediscovering Oman's cultural heritage. We continue along the Corniche to visit the Muttrah souk (the old market), a blend of history and modernity surrounded by magnificent merchants' houses dating back to the 18th century. Here we have some free time for shopping before arrive at the Al Nahda Resort on the coast of Batinah for a buffet lunch. In the afternoon we visit the fort and the Nakhal springs before returning to the ship. Guests must abide by appropriate dress, modest, no revealing or see-though clothing. Visitors should be dressed appropriately according to the culture of the country being visited. Space is limited, so please reserve in advance. The coach ride between Muscat and Nahkal takes about 2 hours each way.